We aggregate and summarize all insurance loss for an individual commodity for a set of years, creating a sparse matrix of damage causes for each county. We initially estimate the optimal number of clusters using NBClust to pick the optimum number of clusters by using a range of methods and then selecting bed option. Using this optimal cluster number, we visually examine our clusters (again, which are for a singular commodity, per year, at a county level) using a PCA based 2 dimensional plot (using PC1 and PC2). We then map our clusters spatially. 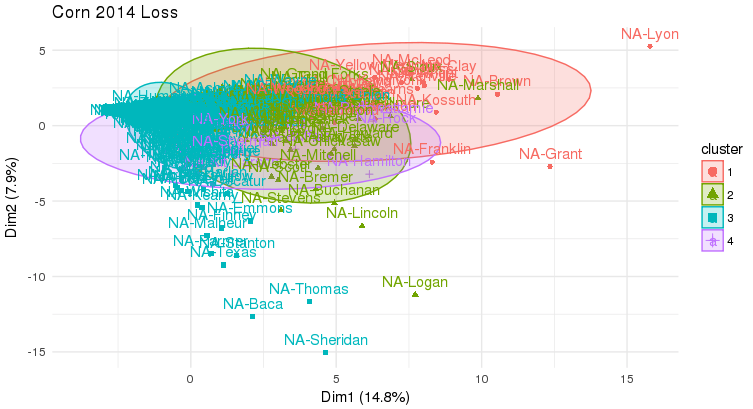 The cluster plot lists the amount of variance for each PC. The example plots and maps below are for corn and wheat, for water scarcity damage causes (drought, heat, excessive sun, fire, hot wind) and cold (cold wet weather, cold winter, freeze, frost). Again, this methodology can be run for any commodity across the full time frame range of insurance claims. 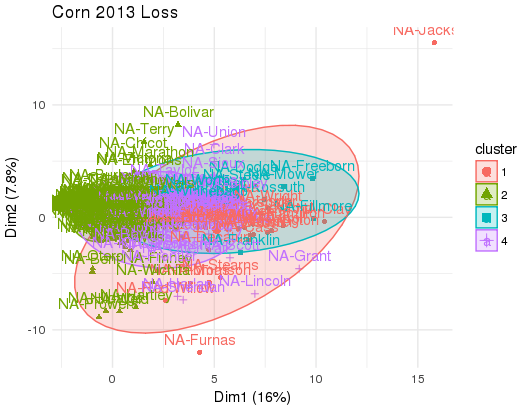 Finally, the below analysis is for loss per acre ($).